Our CNY was nothing short of brilliant: family, friends & festive food. 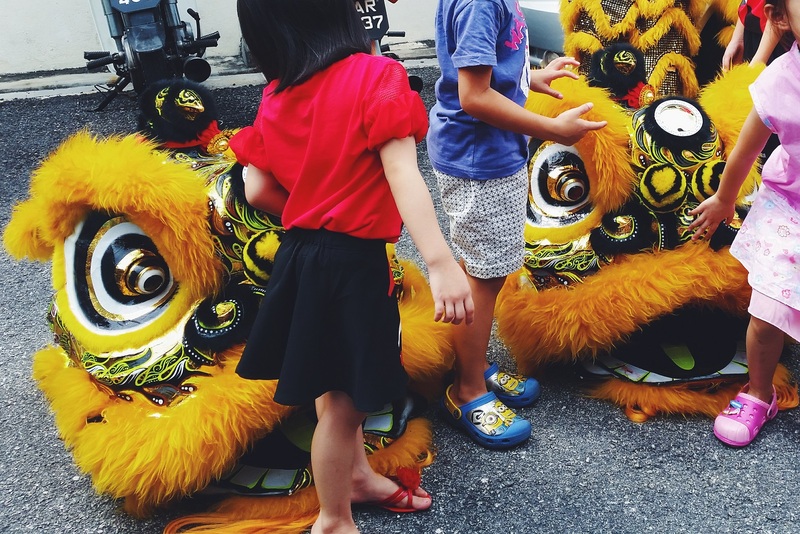 This year was extra fantastic because it fell on a Monday and Tuesday so everyone enjoyed the super long weekend. 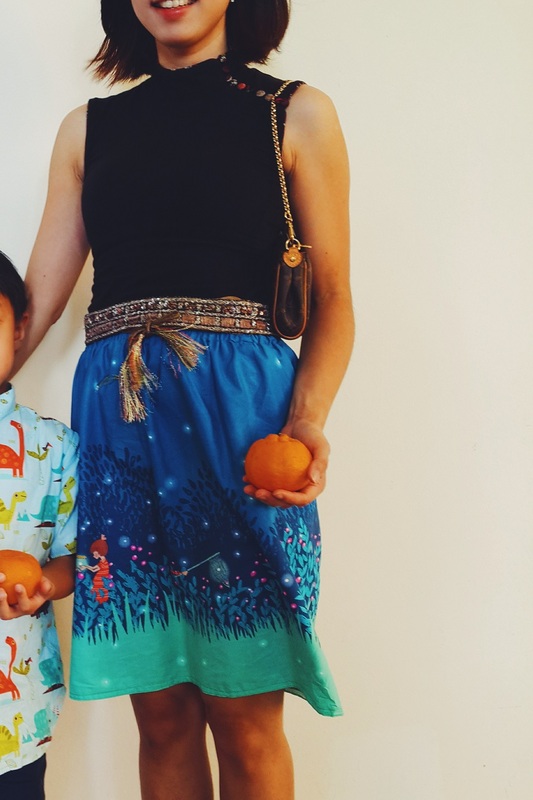 Bubs and I wore outfits lovingly handmade by my Mum-in-Law. She used to be a seamstress so we're exploiting fully appreciating her talents. Can't believe that Hubs said that he and his siblings preferred store bought clothes, pffffft. Mum-in-Law is also an amazing cook. 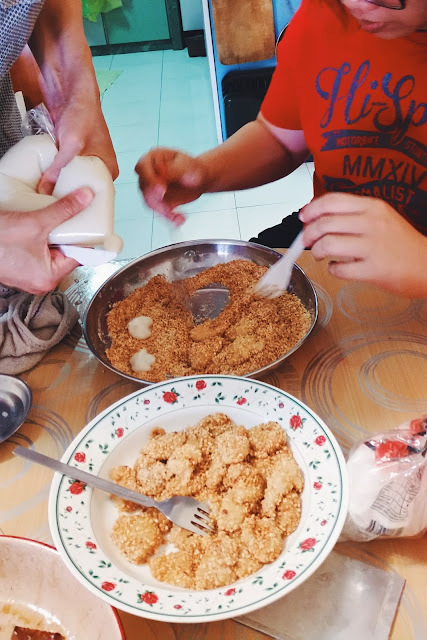 She actually made her own bak kwa (dried meat) which was so flavoursome that I made or made not have depleted most of her supply *shifty eyes* She also made muah chee (glutinous rice chunks coated with crushed peanuts). This was Hubs and his sister, busy churning out platefuls of the yummy morsels. 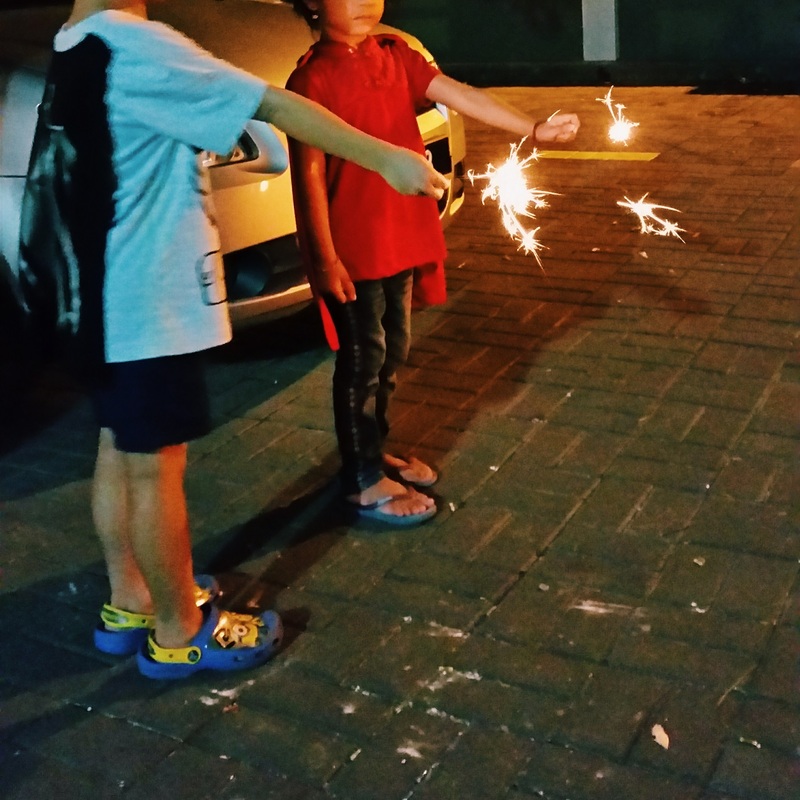 Bubs was deliriously happy lighting up sparklers and flinging "pop pops" with his cousin after reunion dinner. 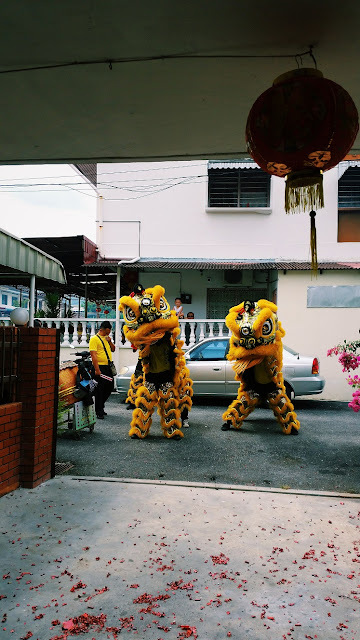 Kelly invited us over to her parents' place for the annual lion dance that they always hire. Needless to say, the lil 'uns had so much fun playing together. Bubs was a little teary eyed at the beginning, "It was too loud, Mummy" but cheered after I told him that he was a lot braver than me; when I was his age, I was so freaked out by how scary and gigantic the lion heads were, I refused to go near them, even for a photo. 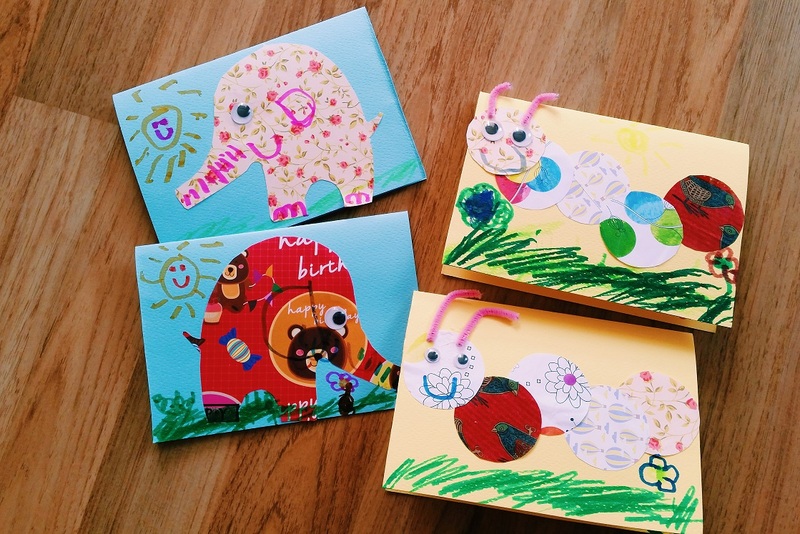 Bubs made cards for his friends that were having birthdays in February. I cut out the shapes for him while he glued everything on and added in details. "Elephants have wrinkly trunks and BIG ears." he said as he carefully drew them on. 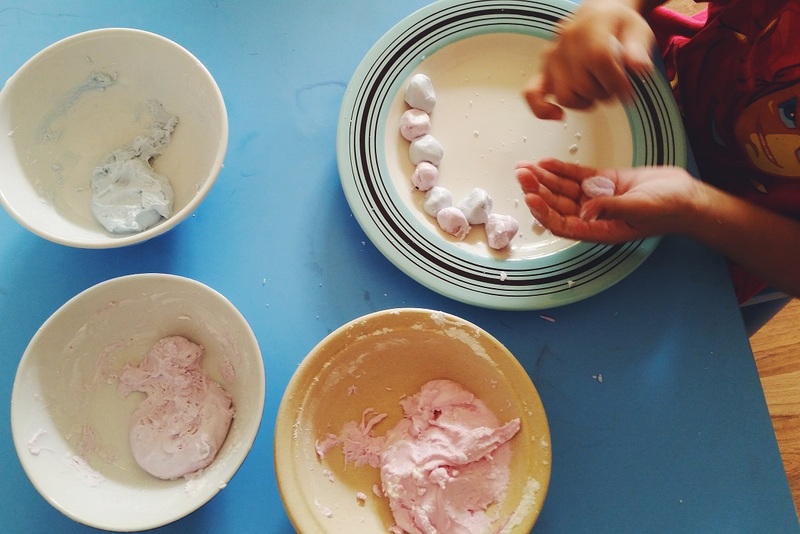 We made tang yuan (glutinous rice balls) again. This time around, I wanted to colour them naturally so we picked some bunga telang (butterfly pea flowers). 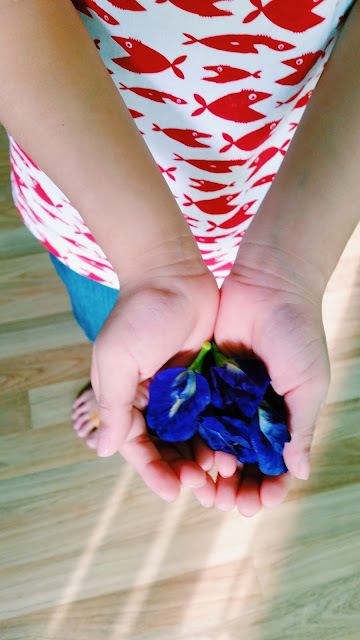 I was puzzling over how to extract the blue dye from these beautiful blooms until Bubs confidently told me to steep them into water. "At school, we soak them in water and the water turns blue. We use it to water the plants because they like blue water." 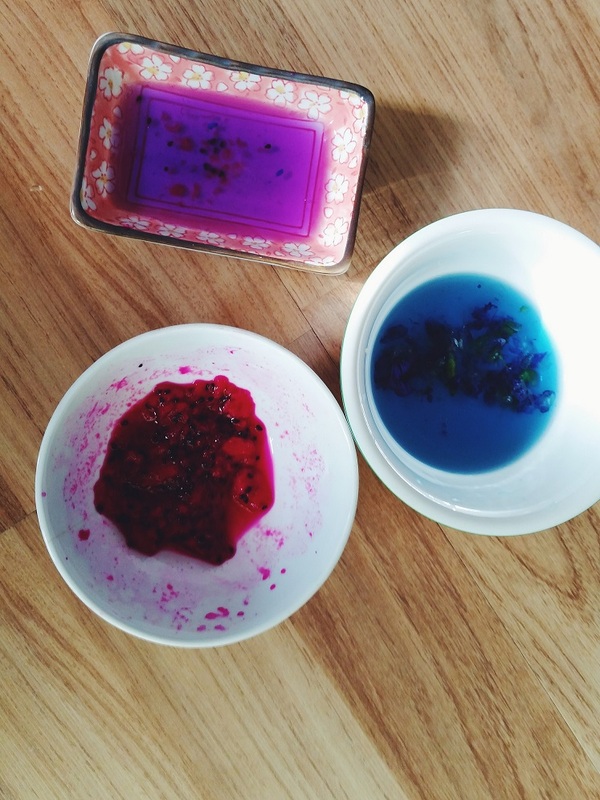 Since I'd some dragonfruit too, I used them to make red dye and showed Bubs how to get purple from these 2 colours. The colours were very pastel: soft blue, lilac and baby pink. They looked really pretty and when Bubs accidentally mixed some of the colours together, they became rainbow swirly marbles. I felt like a true nonya when making the dough. I didn't Google for a recipe and used agak agak (estimates) in proportioning the water to glutinous rice flour. Bubs was my tester, "Mummy, this is too sticky." he'd come running back to me and I'd then add more flour to the mixture. Back in the good ol' days, this was our Play Doh and it was such a treat to make this in the kitchen.